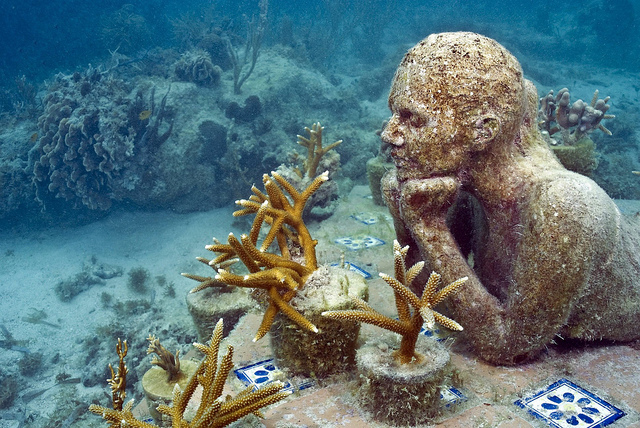 There is a place where underwater life and contemporary art meet to merge into one unicque and magic system. 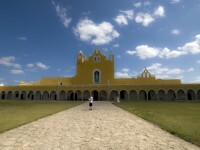 In Mexico, at the bottom of the Caribbean Sea, inside the National Marine Park of the Yucatán Peninsula was recently opened the largest underwater museum in the world and attracts every year around 750,000 visitors. The Cancun Underwater Museum Project (MUSA) is signed by the British sculptor Jason de Caires Taylor and consists of four systems: “La Jardinera de la Esperanza”, “El Coleccionista de los Sueños Perdidos”, “Hombre en Llamas” si “La Evolución Silenciosa”. 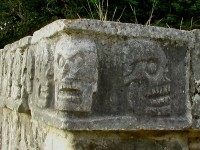 The museum has more than 400 life-size statues representing people of that place, witnesses of human history from the beginning of the Mayan civilization to the present. 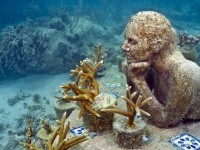 The artwork of the underwater museum already impresses by size: lies on 420 square meters of seabed and weighs 180 tons. The sculptures placed in shallow (9 m) have been completed in 18 months from a mixture of cement, sand and silica compounds – a mix with neutral pH, specifically designed to please marine creatures. Ultimately, the purpose of the integration of artificial reefs in marine surrounding is a very preactical one: environmental protection, especially the protection of the Mexican reef barrier. This is being at risk for many years, both because of climate change, and the devastating impact of hundreds of thousands of tourists who come each year to dive in Cancun. 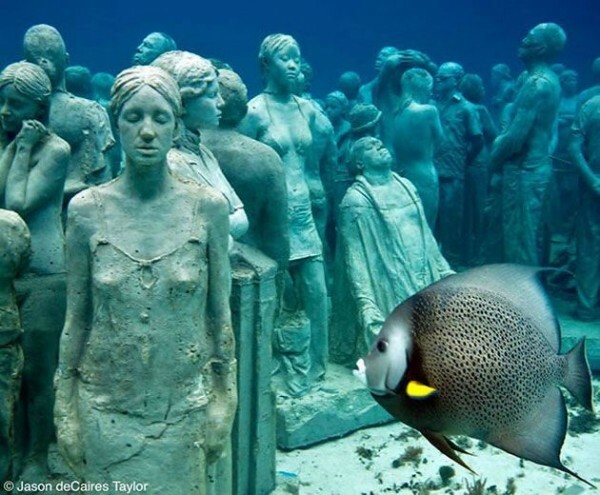 Over time the sculptures of the Cancun Underwater Museum will turn to artificial reefs being colonized by fish, mollusks and corals, but offering at the same time visitors the opportunity of some privileged meetings. In the underwater world, anything is exposed to the changes of light and weather conditions. Because the chemical composition of the sculptures is actively supporting the colonization by corals and other marine creatures, the artworks will change over time reshaping and redefining the submarine landscape in an unpredictable way. 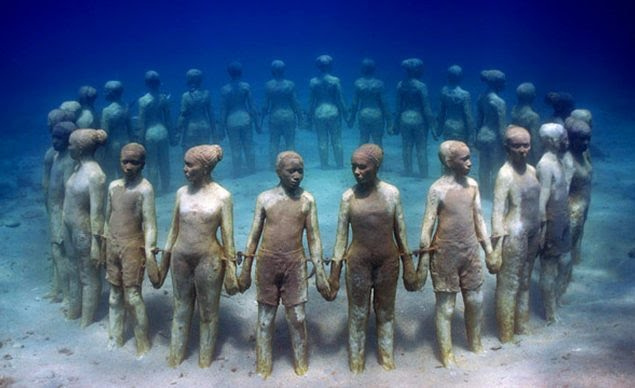 The marine organisms are those who will perfect the artworks of the Underwater Museum near Cancun with the relentless motion of the waves that is a continuous, unique and inimitable work, which is able to equal and even to exceed the work of any artist. 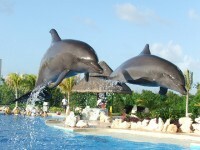 The underwater experience is completely different from being on the land, says the artist on his website. There are optical and physical facts that can not be ignored.For example in the depths, objects appear 25% larger and closer than they actually are. The colors change too, as the light is absorbed and reflected in different proportions, the depth of water adding the final “touch” In addition the light comes from the surface of the water this producing kaleidoscopic effects governed by water movement, currents and turbulence.